"What if I told you...the legend before the legend?" I love ESPN's 30 for 30 series of sports documentaries. Even when I'm not familiar with the subject matter (or interested in it), these films find ways to be compelling and connect on a level that goes beyond sports. 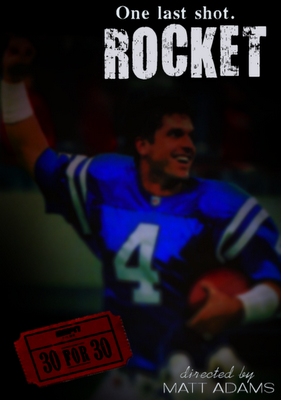 If I had the power to create my own 30 for 30, I'd focus on the Indianapolis Colts. Some people would probably think I'd go for the Manning Era--and there are certainly many compelling stories to tell from that amazing run. In fact, I expect we'll see a documentary in 15 or 20 years called The Breakup or The Divorce chronicling the rise and fall of Peyton Manning's career with the Colts. Let someone else tell that story. If given the chance to write or direct my own 30 for 30, I'd go back to a time before Manning, an unforgettable run by a scrappy team that refused to die. A team that came within one pass of making one of the most unlikely Super Bowl appearances in the history of the NFL. I would tell the story of the 1995-1996 Indianapolis Colts. This was the team that inspired my never-ending love for the Colts. For much of my life before that year, I wasn't all that interested in football. When I did root for an NFL team, I pulled for Boomer Esiason and the Cincinnati Bengals. As the years passed, the Bengals became less and less relevant. Then the Colts got Jim Harbaugh. I loved Harbaugh. I don't know why I loved Harbaugh, but I did. I don't have to explain why and couldn't if I tried. Harbaugh was my guy. Thing is, Jimmy started out as the backup QB. The Colts acquired Craig Erickson, a move that was supposed to be a big-time one for the club. Erickson struggled. Harbaugh came off the bench to rally the team on multiple occasions. "Captain Comeback" was born. Badgered and chased out of Chicago after a disappointing career (and a memorable tiff with coach Mike Ditka), Harbaugh seemed ready to accept life as a backup after the Erickson deal. When Erickson struggled, Harbaugh rallied the team in memorable fashion, leading the Colts to four comeback wins (at the New York Jets, at the Miami Dolphins and at home against the San Francisco 49ers and New England Patriots). His comeback wasn't just in individual games--Harbaugh resuscitated his career by playing loose and living Ted Marchibroda's credo to "let 'er rip." The Colts finished the season 9-7, shocking the NFL by making the playoffs and defeating heavily-favored San Diego and Kansas City on the road. It set the stage for an AFC Championship Game at Three Rivers Stadium against the Pittsburgh Steelers--a game packed with dramatic moments made for a 30 for 30 documentary. There was Quentin Coryatt's interception that could've ended the game. A run by Lamont Warren (backing up injured Marshall Faulk) that could've picked up a key first down to drain time off the clock. Instead, a blitzing Pittsburgh cornerback who wasn't even supposed to blitz managed to trip up Warren, forcing the Colts to punt. A blown call resulted a Pittsburgh touchdown when Kordell Stewart stepped out of bounds right in front of an official but no one saw it (except for everyone in the stands and cameras from every conceivable angle). The Steelers scored with about a minute and a half left to take a 20-16 lead. Harbaugh and the Colts had the ball at their own 15 yard line. After picking up first downs with a few completions and a scramble, Harbaugh clocked the ball at the Pittsburgh 29 yard line with five seconds left. One last shot at glory. When the play came in, Harbaugh gave it to the rest of the team. "Rocket" was the call. For the football layman, it's the desperation heave. The last-gasp play. The Hail Mary. I can still see Harbaugh in my mind's eye, his hand bleeding from an injury, a prizefighter who'd gone too many rounds. He'd taken body blows, staggered back, almost been put to the mat. He got up like he always had. I believed. A run like this simply couldn't end. Harbaugh would rally. We called him Captain Comeback for a reason. He took the snap and scrambled like he always did, rolling out to avoid the rush, teasing the defense with the possibility of making a play with his feet. There would be no scramble. Not this time; time wasn't on his side. Harbaugh launched it toward the end zone. I watched. I waited. I hoped. That ball hung up forever--part of me still sees it in the sky above Three Rivers, promise suspended in infinity. But what goes up must come down. Right on Aaron Bailey's chest. He had it--and then he didn't. The ball fell to the ground, its silence deafening. A Hail Mary, a prayer falling on deaf ears. Rocky losing to Creed by decision. Harbaugh would lead the Colts to the playoffs the next year before suffering through an injury-plagued season in 1997-1998, when the Colts finished 3-13. His final comeback attempt--a game against the Minnesota Vikings--would also fall short, assuring the Colts of the first pick in the NFL Draft. For those three seasons, Jim Harbaugh was my legend. I've never forgotten him, even though another legend rose to replace him. They often say there was no football in Indianapolis before a young Volunteer arrived. And while he broke records and erected a football cathedral in Indianapolis, my legend came first.